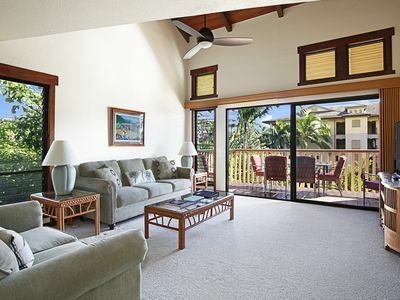 This is a VERY spacious (1550+ square feet), newly renovated and decorated, ground level, 3BR/2BA ocean view condominium in the upscale Makahuena Resort located in the heart of Poipu. 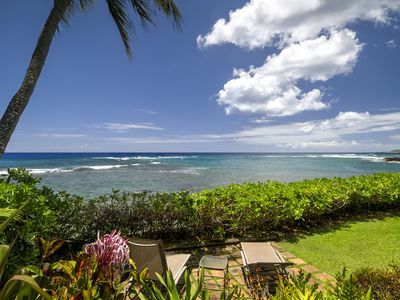 Poipu Beach is Kauai's most desirable area and was just rated the #1 beach in all of America. 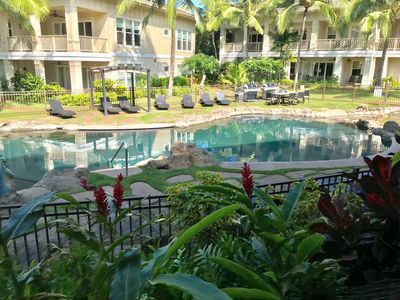 My unit is among one of the biggest condominium's you'll find in Poipu! The unit's size and internal layout provides spacious comfort for as many as 8, (additional space for small children) but can also work well and is priced perfectly for smaller groups. My condo just underwent a 3 month renovation. Kitchen was updated with brand new cherry cabinets, granite counter tops, and high end fixtures. Brand new, custom master bathroom features cherry wood vanity with double sinks and granite counters, and a custom tile shower complete with a bench and a niche. New tile spans throughout the entire unit and it looks amazing. With freshly painted walls, each room now offers a custom feel. 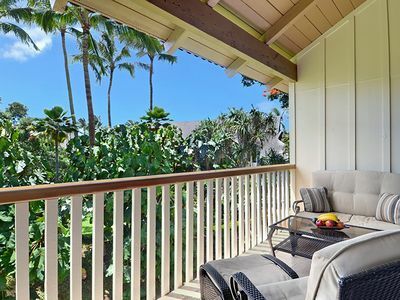 You won't find a nicer condo in all of Poipu - it's truly am amazing place to stay! 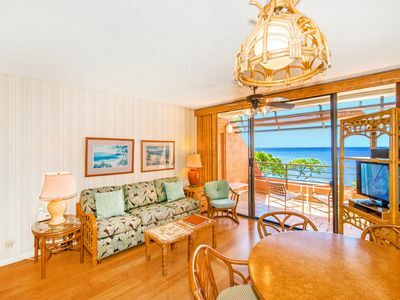 The condo is also professionally decorated by an island expert! 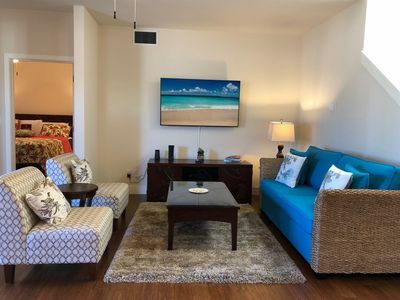 We recently purchased all new upscale, high end teak furniture, 3 new mattresses with the king being memory foam, 3 new TVs, all new kitchen supplies, beach toys, art work and decorations. 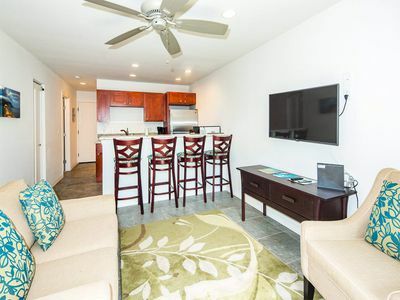 With the new furniture and remodel, this unit is essentially brand new. The floor plan is all contained on the first floor with no interior stairs. (There are a few stairs leading down into the unit). Its single level eliminates the need to climb stairs to bedrooms or bathrooms. Our seniors especially appreciate this convenience. 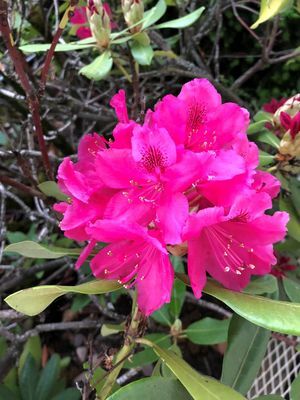 High speed wireless internet is available to stay connected should you chose to. Air Conditioning in the master bedroom can provide icy cool off after a full day under the sun. 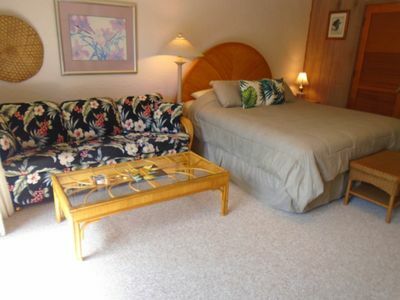 There are also optional Air Conditioners available for both other bedrooms for an additional $100 / week. The two twin beds in the third bedroom can be made into a king. Extra sleeping on the brand new pullout queen size couch. All beach stuff included! Chairs, floaties, coolers, boogie boards... we have it all! 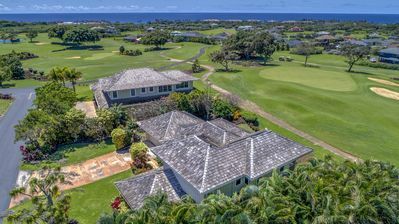 From the lanai you're only steps away from the impeccably maintained grounds, pool, spa, barbecue, view point, and other entertainment areas. 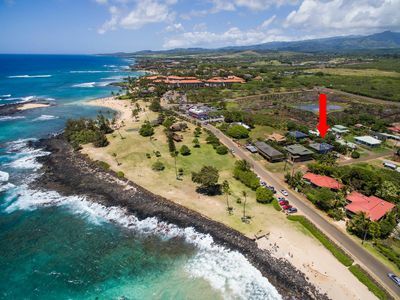 The Makahuena resort is in the center of the Poipu golf world and is walking distance from Poipu Bay (former site of the Grand Slam). 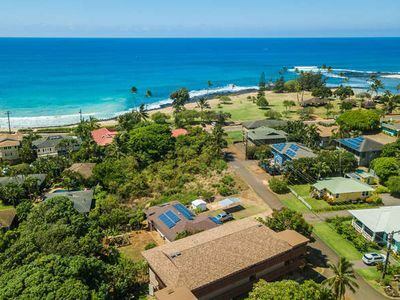 The Makahuena contains it's own tennis facility and is under a 10 minute walk to two top rated sandy beaches that provide sunbathing and surfing (Shipwreck Beach and Brennecke's Beach). Brennecke's beach is a top destination for toddlers & children because of its extremely calm and shallow water. 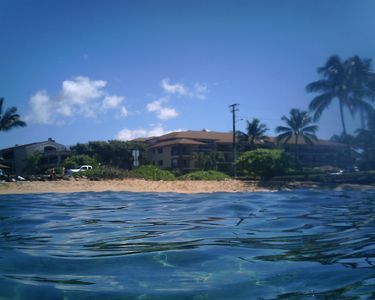 This also makes it a top destination for snorkelers. 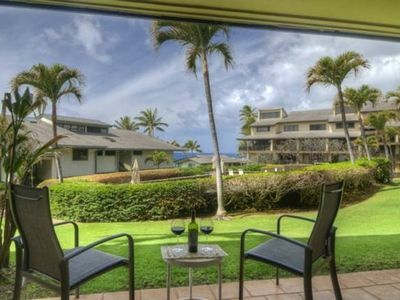 The resort is named after Makahuena Point, which is located on the southernmost point on Kauai. 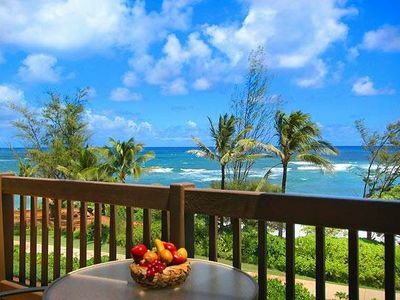 The resort complex sits on a cliff and overlooks the ocean providing an unforgettable view and experience. 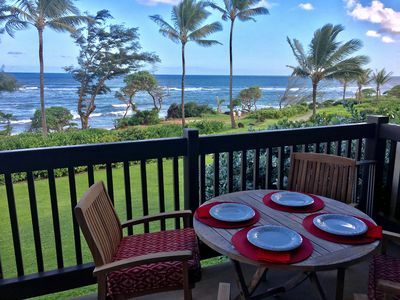 The 'Point' is only a few steps from unit's lanai where you'll see a breathtaking view of the waves crashing into the cliffs. 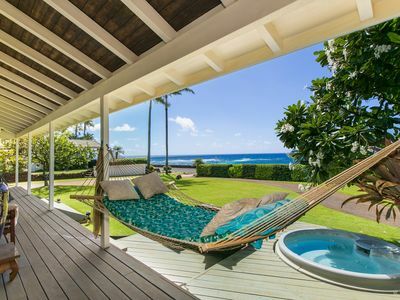 You’re also likely to see whales, turtles, dolphins, and the occasional Monk Seal. Check out these other units I own. Perfect if this is unavailable or you’re looking for multiple condos. All 4 are very close together! 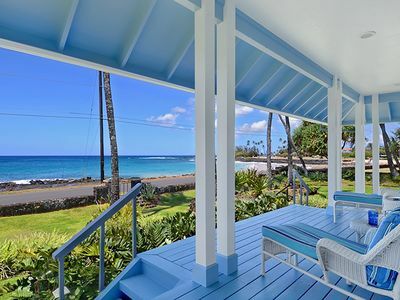 Waikomo Stream Villas #132: Great Garden Views in a Central Poipu Location! 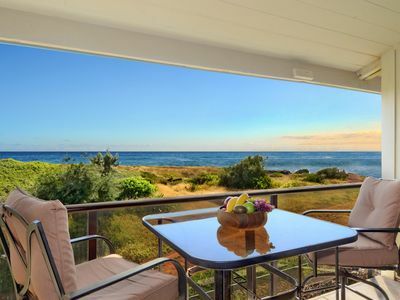 Makahuena #4305: Premier 2 bedroom with calming views of Kauai's Sunrise! 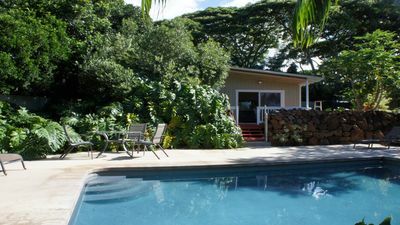 Pili Mai 3B: Large Family Home With Pool Access, Discounted for Construction Next Door!